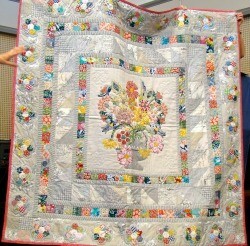 Demystify floral applique with Christine Lethlean …! See what they did with Pat’s playful curves! Yes – there are now six more EQI members who know that three pins is enough to machine piece a Drunkards Path (DP) Block irrespective its size. 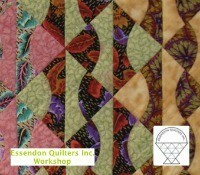 Yes – all present have mastered the art of chain piecing curves thanks to Pat’s Stevenson’s Master Class. Yes – we all had a great time and loved Pat’s teaching. Yes – there was a cake and biscuits to share.